Prospectors discovered gold in eastern Oregon in 1861 and quickly sparked a rush of miners that led to the creation of Baker City. Soon a saloon, hotel, and blacksmith shop opened, followed by a quartz mill in 1864. The next year the town was laid out and in 1868 it succeeded Auburn as the county seat of Baker County. Baker City officially incorporated as a city in 1874. The Oregon Short Line Railroad came to Baker City in 1884 and encouraged continued growth. 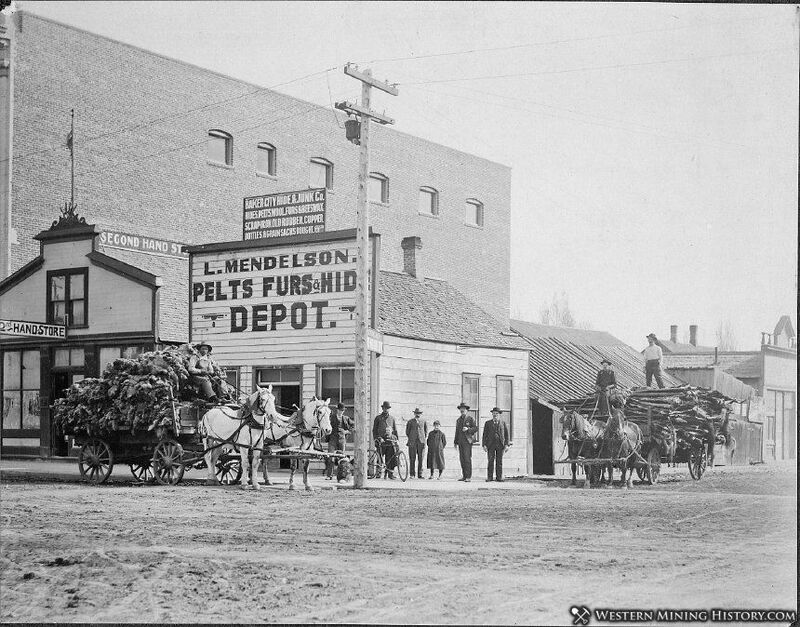 By the 1890s the city gained a reputation as the "Denver of Oregon." 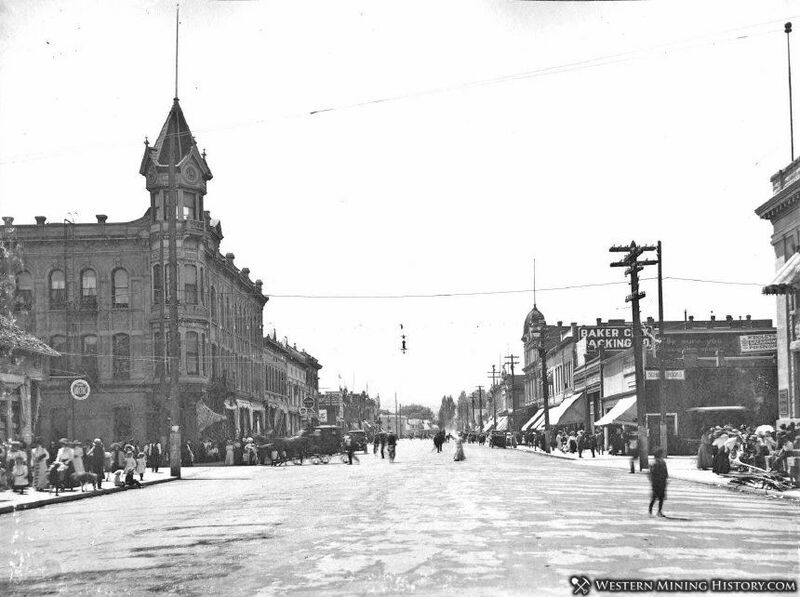 During this period, Baker City was one of the more colorful towns in the Pacific Northwest as miners, ranchers, cowboys, and sheepherders mingled with gamblers and dance hall girls. 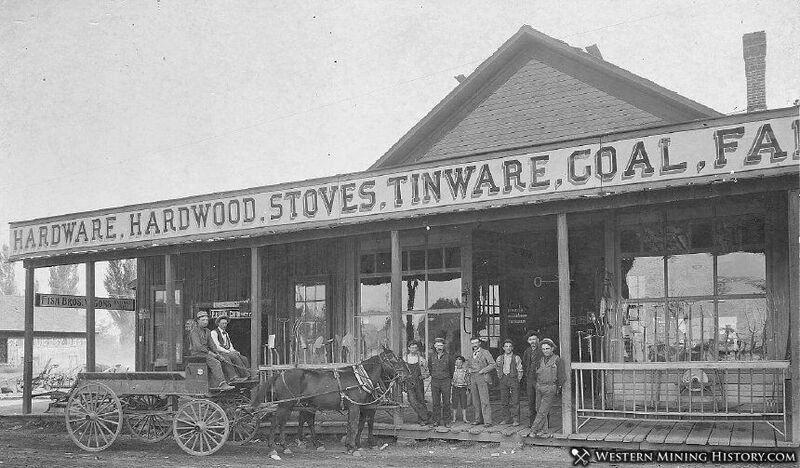 By 1900 it had become the trading center for a vast region and was the largest city between Salt Lake City and Portland. Construction of the narrow gauge Sumpter Valley Railroad in 1896 and the Transatlantic Railway in 1897 helped the mining and timber industries flourish for decades. Access to seemingly endless supplies of timber in the nearby mountains kept area sawmills humming and provided employment for hundreds. But falling mine production and the closing of more public forests to logging caused a downturn in the area's economy in recent decades. Almost exactly in the geographical center of this grand mineral empire has arisen, as its natural capital and metropolis, the handsome little city that bears the name of Oregon's soldier-statesman, General E. D. Baker, the hero and victim of Ball's Bluff. It is situated, at an altitude of 3,440 feet above the level of the sea, on the line of the Oregon Railroad and Navigation Company, 345 miles southeast of Portland; and is the county-seat of Baker county, which, with an area of 2,322 square miles, is larger than the state of Delaware, and nearly twice as large as Rhode Island. Like all the other counties in the Oregon Gold Belt, Baker county is diversified with mountains, valleys and streams. The mountains are all mineralized, the valleys are all fertile, and the streams are all bottomed with placer. beds. There is hardly an acre of the whole domain that is not rich in mineral, timber, pasturage or agricultural capabilities. Wheat yields from 40 to 60 bushels to the acre. Sheriff W. H. Kilbourne has averaged 51 bushels. Assessor J. A, Payton made out a list of 42 farmers. two or three years ago, whose crops of oats and barley averaged 65 bushels to the acre; and Anson Loenig, on Willow creek, raised 110 bushels of barley to the acre. The valleys in every direction yield abundant crops of all the leading grains, grasses and vegetables, and fine fruit is grown in the lower altitudes. The climate is unsurpassable in all the qualities conducive to health and vigor. There are no extremes of heat or cold. The winters are so mild that cattle run on the ranges all the year without feeding or care, and prospecting can be carried on at all seasons. Thousands of cattle, sheep and horses are raised without expense. Everywhere north and west of Baker City are magnificent forests of timber for all building and mining purposes, and from 25,000 to 50,000 feet to the acre is an ordinary yield. The whole region is watered by clear, pure mountain streams, Powder river running through the very heart of Baker City. The Oregon Railroad and Navigation Company gives the young city every facility of transportation and communication with the outside world, and the Sumpter Valley narrow-gauge railway connects it with the great mines, forests, farms and ranges lying west and southwest of it. Well-constructed wagon-roads, either directly or by connection with the railroads, bring it the trade of a large part of Baker, Union and Grant counties, and the northern end of Harney and Malheur counties, besides much from the Idaho side of Snake river. It is the natural depot and distribution-point for the mines and mining camps of the entire region, including something like a half-hundred districts. With such a position and such surroundings, Baker City could not have failed to thrive as few western towns have done in recent years. It has more than tripled its population since the census of 1890. rising from 2,600 then to 8,000 now - a rate of growth, which, if continued, will give it from 25,000 to 30,000 people under the next decennial enumeration. The annual gold yield of its immediately tributary region has increased, in that time, from about $500,000 to $3,500,000 - a ratio that will speedily bring it up to $20,000,000 a year. 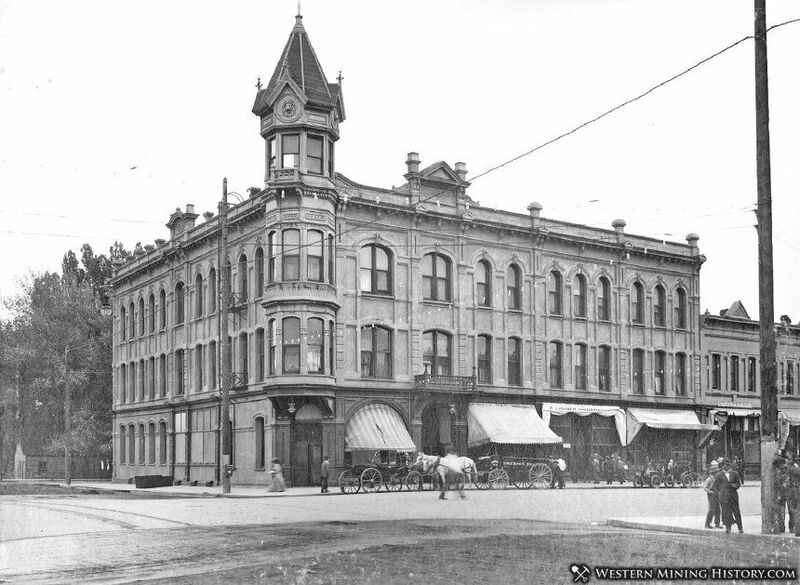 Since the last edition of the Oregon Railroad and Navigation Company's Gold-Field booklet was issued, between 40 and 50 handsome business buildings of brick and stone have gone up in Baker City, including the Geiser, Haskell, Pollman, Rust, Ison, Alfred and Waterman blocks, costing from $10,000 to $30,000 each. A 70-room hotel and several smaller ones have been added to the 15 that already offered hospitality to the incoming army of fortune-seekers. The Sisters of Saint Francis have built a $40,000 addition to their academy, and a $25,000 extension of Saint Elizabeth hospital is planned. An extensive cold-storage plant has been put in; scores of new mercantile and industrial establishments have gone into operation, including a smelter, two planing-mills, a steam laundry employing 32 persons, two cigar factories, two wholesale groceries, and two wholesale liquor and tobacco houses; and over 400 residences have been erected to accommodate the growing population. Albert Geiser, of Bonanza fame, has just paid $40,000 cash for the Warshauer House, and proposes to spend $15,000 or $20,000 more in making a first-class hotel of it. The Masons have recently finished a $20,000 temple of Faith, Hope and Charity, and an opera-house, with all the modern metropolitan improvements, will soon be completed, and playing the same attractions that appear in Portland. A $100,000 waterworks system is being installed, and everything is moving with a rush. The manufactories include six saw and planing-mills, with a daily capacity of about 175,000 feet of lumber, or something like 55,000,000 feet a year;-the Oregon Lumber Company alone employing between 300 and 400 hands, and having a capacity of about 30,000,000 feet. There are two mills near Haines station on the Oregon Railroad and Navigation Company's line, 10 miles northwest of the city, with a combined capacity of from 20,000 to 25,000 feet a day. The Powder River Land and Irrigation Company is rapidly pushing to completion the most extensive work of its kind in the state. Its canals and ditches parallel the Oregon Railroad and Navigation Company's tracks for 20 miles. Its main reservoir, a half-mile east of the city, at an elevation of 60 feet, is a mile long by a half mile wide, with a depth of 70 feet, and holds 400,000,000 cubic feet of water. It will bring from 60,000 to 100,000 acres of rich lands into cultivation, and will add at least $2,500,000 to the annual production of the region and the business of the city. The neighboring mines give employment to from 1,600 to 2,000 men, whose pay-roll amounts to something like $1,500,000 a year, most of which is spent, directly or indirectly, in and about Baker City. 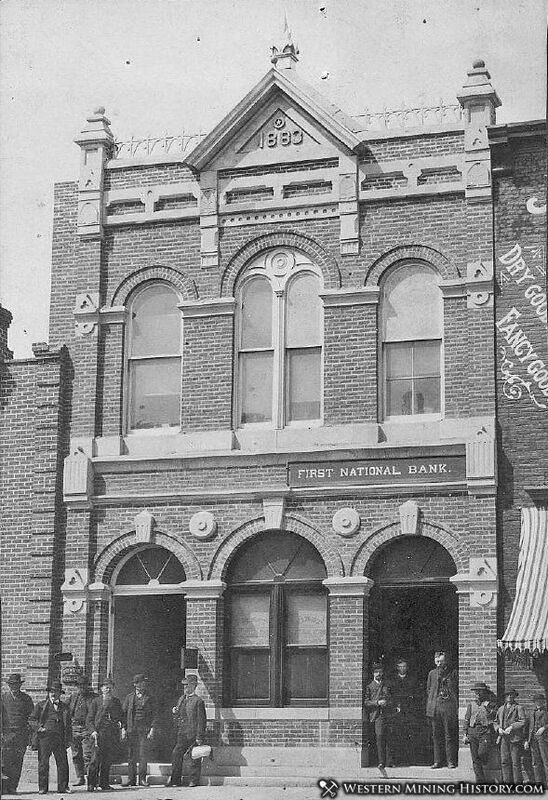 During 1893, The First National Bank of Baker City shipped, in gold dust and bullion, $264,165; in 1894, it shipped $274.505; in 1895, $360,268; in 1896, $529,266; in 1897. $750,000; and last year, with all the new banks, express companies and shipping facilities, its shipments neared the $1,000,000 mark. Could the rapid rise of gold production be more concisely shown? This includes no shipments of ore or concentrates, and no drafts, checks, or money-orders for sales made by miners. It is simply the gold-dust and bullion record of one bank. 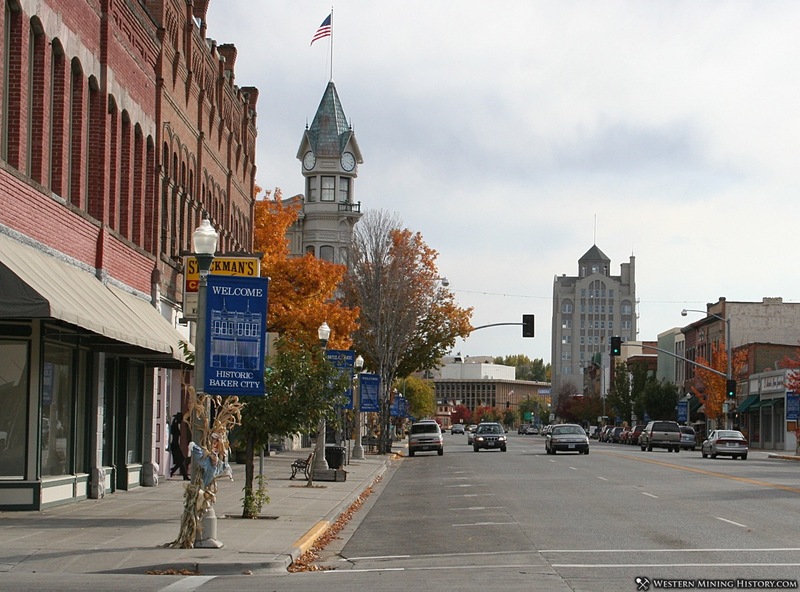 Baker City is equipped in metropolitan fashion with waterworks, gas and electric-light plants, a street-railway, and two live daily news papers and a half-dozen weeklies. The Morning Democrat, which has Mergenthaler typesetting machines and takes the full Associated Press dispatches, and The Evening Republican, may occasionally pull hair over political questions, but they are always found pulling together for the good of their city, county and region. The streets are broad and well kept, the churches and schools are numerous and handsome, and many of the public and private buildings would be creditable to a city of 50,000 people. 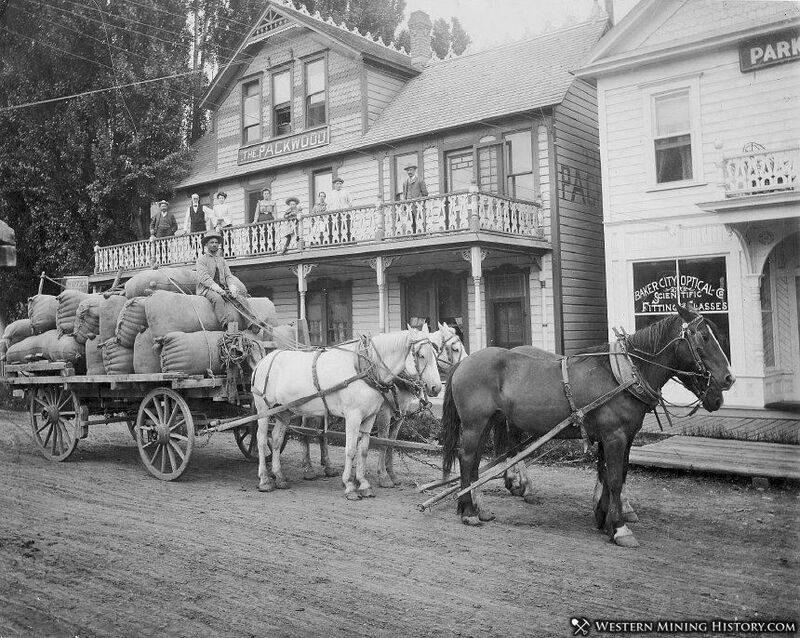 The Oregon Railroad and Navigation Company has a large and conveniently arranged depot, a fine stone-and-iron warehouse, and extensive stockyards, and the Sumpter Valley Railway has ample buildings and terminal facilities. A number of new railroad branches and extensions are being planned, including one to the great Seven Devils Copper region of Idaho, and movements are on foot to establish smelting and reduction works on an extensive scale. Baker City is one of the busiest and most prosperous places in the West, and its future is loaded to the muzzle with golden promise.